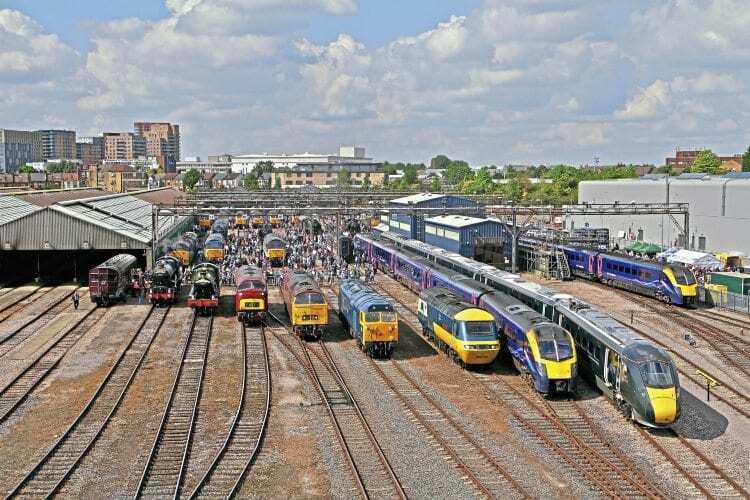 OLD Oak Common charity open day certainly lived up to its Legends of the Great Western billing, attracting more than 7,000 visitors to the West London depot. The event took place on September 2, after many months in the planning. It is probably the last event to be held on the site, and celebrated 111 years of Old Oak as a railway maintenance depot; the first depot opened on March 17, 1906. Chances to see behind the scenes of a modern depot are few and far between, and for the ‘Legends’ event, GWR worked very hard to create unique photographic line-ups representing the various generations of motive power that have worked on the Great Western. This included steam, in the form of a ‘King’ and a ‘Hall’, to the soon-to-be-introduced Hitachi Intercity Express Train (IET). Locomotives were carefully positioned for photographers. For one of the line-ups, it was a case of six of the best with half a dozen preserved Class 50s side-by-side, while the main line-up consisted of nine exhibits representing motive power that has worked on the Great Western through the years, including a seventh Class 50. More words and images in October’s issue of The RM – on sale now!